"A family with two kids that earns the minimum wage still lives below the poverty line. That's wrong…Tonight, let's declare that in the wealthiest nation on Earth, no one who works full time should have to live in poverty." Since its inception, the federal minimum wage has been used as one way to help alleviate poverty and promote a sense of economic fairness. The federal minimum wage was first enacted in 1938 as part of the Fair Labor Standards Act and set minimum hourly wages at 25 cents per hour, but the law excluded large segments of the labor force. The current federal minimum wage is $7.25 per hour, which means a full-time minimum wage worker earns $15,800 per year. At this level of income, a three-person household that includes at least one child (for example, a couple with one child or a single parent with two children) falls below the poverty threshold (approximately $18,500).1 Many argue that a full-time worker should earn a wage that supports a household—especially in the United States, a wealthy nation. This seems especially relevant given the recent increase in income inequality. NOTE: The Gini coefficient (also known as the Gini ratio or index) is a common measure of income inequality within a nation. It gauges income disparity on a scale from 0 to 1, with higher numbers indicating higher levels of inequality. The lowest value for the United States was 0.386 in 1968 and the highest value in 2011 and 2012 at 0.477. SOURCE: Federal Reserve Bank of St. Louis FRED; http://research.stlouisfed.org/fred2/graph/?g=s2w&dbeta=1. 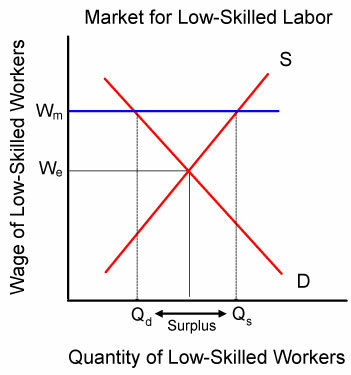 Labor markets, like other markets, have a supply side (workers supply labor) and a demand side (employers demand labor), and their interactions result in an equilibrium price—in this case, the price paid per unit of labor is an equilibrium wage. The minimum wage acts as a price floor for low-skilled labor. When the government (federal or state) increases the legal minimum wage (labeled Wm in the diagram) above the equilibrium wage that the market would determine (We in the diagram), predictable outcomes occur: The higher wage (Wm) increases the quantity of workers willing to work at the higher wage (Qs, quantity supplied, in the diagram), but the higher wage also decreases the quantity of workers that firms wish to employ (Qd, quantity demanded, in the diagram). The result is a surplus of workers (Surplus in the diagram), where more workers seek employment than there are jobs available at the mandated minimum wage—and the workers who fail to find employment are unemployed. In many cases, economists who support a higher minimum wage acknowledge that the policy might reduce employment, but they argue that the employment effects are likely to be very small and the benefits to wage earners are certainly large.3 So, many workers would have higher wages, which would boost their family income, and a smaller group would be jobless, which would reduce their family income. In short, the benefits of the higher wage outweigh the costs in terms of lost jobs. Economists who oppose such policies argue that increasing the minimum wage does significantly reduce low-skilled jobs.4 For example, a recent study by the Congressional Budget Office (CBO) estimated that raising the minimum wage to $10.10 would reduce total employment by 500,000 workers.5 Economists also warn of unintended consequences of the policy that might disproportionately hurt those whom the policy was meant to help. For example, since the policy reduces the number of jobs available to low-skilled workers, it restricts access to entry-level positions that the youngest and least-skilled workers need to gain valuable skills and work experience. In addition, too often the working poor do not benefit from the higher wage; rather, the working poor bear a disproportionate share of the jobs lost. As previously stated, advocates propose increasing the minimum wage to help alleviate poverty among the working poor. However, it would be a mistake to equate minimum wage workers with the working poor. The CBO report estimates raising the minimum wage to $10.10 would result in an additional $31 billion in earnings for low-wage workers. However, only 19 percent of the higher earnings would go to families below the poverty threshold. Stated differently, 81 percent of the higher earnings would benefit families who are not poor; in fact, 29 percent of the higher earnings would go to families earning over three times the poverty threshold. Teenagers likely make up a sizable part of this group. In fact, the Bureau of Labor Statistics estimates that 24 percent of minimum wage workers in 2012 were teens. 6 The CBO projections highlight the difficult trade-off presented by increasing the minimum wage: A $10.10 minimum wage could potentially reduce the number of people (currently 45 million) who live below the poverty threshold by 900,000, but in the process, total employment could potentially be reduced by 500,000—a severe consequence for those workers who might transition from low-wage employment to unemployment. Many argue there are more effective ways to help alleviate poverty. For example, food stamps and other welfare programs are specifically targeted to help low-income households. Economists also favor the earned income tax credit, which provides an income subsidy (in the form of a tax credit) to low-income working families. The tax credit benefits are phased out slowly so that workers are not penalized as they earn more income. This policy has proven effective in raising the incomes of the working poor while minimizing the unintended consequences associated with some other anti-poverty programs. Low-wage jobs provide a key opportunity for inexperienced workers to develop valuable skills and work experience, a crucial rung on the ladder of success. However, the income earned is not likely to be sufficient to support a household. While raising the wages of workers seems like it might be a good solution, the proposal makes the mistake of equating minimum wage workers with the working poor. Rather, if the objective is to reduce poverty, it seems that using a more-targeted approach, such as the earned income tax credit, might be the most effective way to accomplish the task. 3 Two often-cited articles are those by Card, David. "Do Minimum Wages Reduce Employment? A Case Study of California, 1987-89." Industrial and Labor Relations Review, October 1992, 46(1), pp. 38-54; and Card, David and Krueger, Alan. "A Case Study of the Fast-Food Industry in New Jersey and Pennsylvania." American Economic Review, September 1994, 84(4), pp. 773-93. 4 See Neumark, David and Wascher, William L. Minimum Wages. Cambridge, MA: MIT Press, 2008; and Neumark, David; Salas, J.M. Ian and Wascher, William. "Revisiting the Minimum Wage-Employment Debate: Throwing Out the Baby with the Bathwater?" NBER Working Paper No. 18681, National Bureau of Economic Research, January 2013; http://www.nber.org/papers/w18681.pdf?new_window=1. 6 See Bureau of Labor Statistics. "Labor Force Statistics from the Current Population Survey, Characteristics of Minimum Wage Workers: 2012." February 26, 2013; http://www.bls.gov/cps/minwage2012tbls.htm#1. © 2014, Federal Reserve Bank of St. Louis. The views expressed are those of the author(s) and do not necessarily reflect official positions of the Federal Reserve Bank of St. Louis or the Federal Reserve System. Earned income tax credit: A refundable federal tax credit for low-income working people designed to reduce poverty and encourage labor force participation. Equilibrium price: The price at which the quantity supplied and quantity demanded are equal. Equilibrium wage: The wage at which the quantity of labor supplied and quantity of labor demanded are equal. Labor market: The market in which workers compete for jobs and employers compete for workers. Minimum wage: The lowest wage that employers may legally pay for an hour of labor. Poverty threshold: The dollar amount the Census Bureau uses to determine a family's or person's poverty status. Price floor: A government-mandated minimum price that must be paid for a good or service. Unintended consequences: The unexpected and unplanned results of a decision or action.